How did you begin your career in hospitality? When did you join the Cayuga Collection at Latitude 10? I studied hospitality & hotel management at Les Roches Marbella Spain. After graduating in 2003, I worked for the Leading Hotels of the World at properties in both Teneriffe and Thailand and then traveled to the United States to receive my B.A in Hotel and Business Administrations at Endicott College in Massachusetts. I stayed on to teach at the Endicott Hospitality School for two years. After eight years abroad I came back home to Costa Rica where I decided that I wanted to work in small hotels where a customer's experience was more personable and, as a team member, you were more empowered to be your true self. Once that was decided, I knew that I wanted to work for the Cayuga Collection! (Actually, I had been trying to join Cayuga for 9 years! You would think that I'd have taken a hint and stop applying, but I didn't.) Finally, after 9 years, I was offered to join the team as the General Manager of Latitude 10 in December 2017 and here I am! 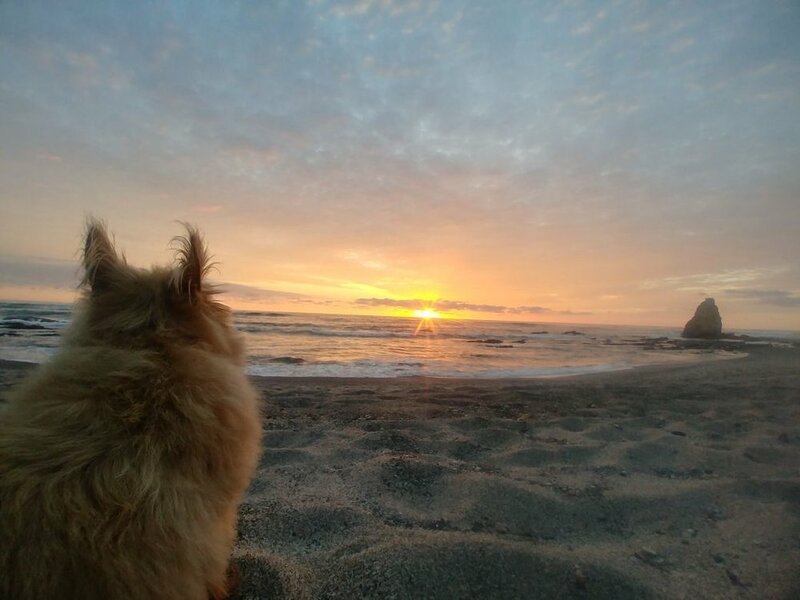 Tika, one of Jennifer's dogs that accompany her to work, enjoys the sunset on the beach right in front of Latitude 10.
Who should come and stay at Latitude 10? Latitude 10 is for people who like being pampered in a non-traditional way, who enjoy nature, yoga and surf and are comfortable going barefoot all day and being woken by howler monkeys in the early morning. At Latitude 10, 5 out of our 6 bedrooms do not have air conditioning or glass windows and have out door showers. On our property walks during check-in I tell our guests we are an open-air concept hotel and enjoy telling them a story of a woman who stayed with us for 10 nights. For the first 4 nights she was super impressed at how clean our "windows" were, when I told her we had no windows we both laughed for a good five minutes while she kept poking her hand through the window frames in amazement! Latitude 10 is a place to connect with nature and relax, a place to be romantic; Latitude 10 is your beach home away from home. Jennifer helped implement complementary yoga at Latitude 10, now offered in the morning a few times each week on the shaded beach in front of the hotel. The biggest reward is being able to be a 'hands-on' manager and work in all departments, I enjoy being in the Kitchen and helping the cooks, being part of the service team and interacting with guests and having the feeling of being home when coming to work. We all became a family at Latitude 10 and it's so rewarding to see staff members profesionally grow and care for one another. The main challenge in operating a small property is trying to be everywhere at the same time! Because we are a small staff (14) we all jump in when needed in different departments, so your attention can go from one place to another in a second. Trying to be on top of everything and available for everyone can also be a little challenging, but with support from all the team members and empowering each and every one of them, these challenges become opportunities for all of us. What is the craziest request you've ever had from a guest? One guest asked if we could keep the monkeys and crickets quiet in the early mornings as they like to sleep late and don't want to be woken by them....I'm sorry, I cannot do that. Ear plugs are recommended if you want to sleep in! What are you most proud of at Latitude 10? What are your favorite aspects of the hotel? I love working for a sustainable ecolodge that hires locally, helps the community and makes guests happy and aware. My favorite aspects of the hotel are the casitas and the beauty and detail in each one of them, the proximity to the beach (literally in front of the hotel) the distance from down town Santa Teresa (8 minute car drive 30 minute walk). This distance is nice, as our location on the Northern part of Santa Teresa it gives you the feeling that you are staying at a private beach; there are no noises aside from wild life and the ocean waves. What is your favorite guest experience that you’ve helped orchestrate? I had a couple who wanted to renew their vows so I took an online course and registered in order to be able to officiate their vow renewal. After the renewal ceremony, we set up a small private beachfront romantic sunset dinner. And we also arranged for a professional photographer to capture their beautiful vow renewal. I am learning to surf (3 months now and I spend more time under the board than on top of the board) but am loving every second of it and have faith that it will click sometime soon! I also love to ScubaDive, go on long beach walks with my dogs and cook at home (with my cats - they don't come to work with me)! Surfing the beach breaks at Playa Santa Teresa. Please share your Insider’s Tips on Latitude 10: What are your favorite places to eat, visit, shop, enjoy culture or nature near Santa Teresa? Culture or Nature: There are so many great places to explore! We are happy to arrange an excellent local guide to take your client's on half and full day explorations of some of the following areas. The Cabo Blanco Absolute Natural Reserve, (40 Minutes from Hotel) created in 1963, is recognized as the first protected area of Costa Rica. Here we have the opportunity to show you the magic of its forest, the important history that surrounds it, as well as the great impact it had on the Costa Rican economy and conservation. Curu WildLife Reserve (1.5 Hours from Hotel): This area is teaming with abundant wildlife and hosts one of the most beautiful beaches and protected bays on the Nicoya Peninsula. The refuge offers easy access to seeing some of the most sought after species such as White-Faced monkeys, Howler monkeys, Spider monkeys, Scarlet Macaws, White-Tailed Deer, Collared Peccary, Coati, Raccoons, Coyotes, Iguanas and hundreds of species of tropical and migratory birds. Curú is Costa Rica’s first private national wildlife refuge and is an example of a successful sustainable development program. Curú National Wildlife Refuge is managed sustainably to produce profit and local employment, while also protecting its threatened and endangered forested habitats such as mangroves, tropical moist, dry forests and coral. Butterfly Farm (30 minutes from Hotel): This is a great outing for families with younger children. Costa Rica has about 12,000 different species of butterflies, just over 11% of the world's species, making it one of the best destinations for observing and exporting these forest wonders. Our naturalist guide will show you the entire life cycle of these wonderful creatures while walking in tropical plant gardens designed for butterflies to fly around while learning from them. 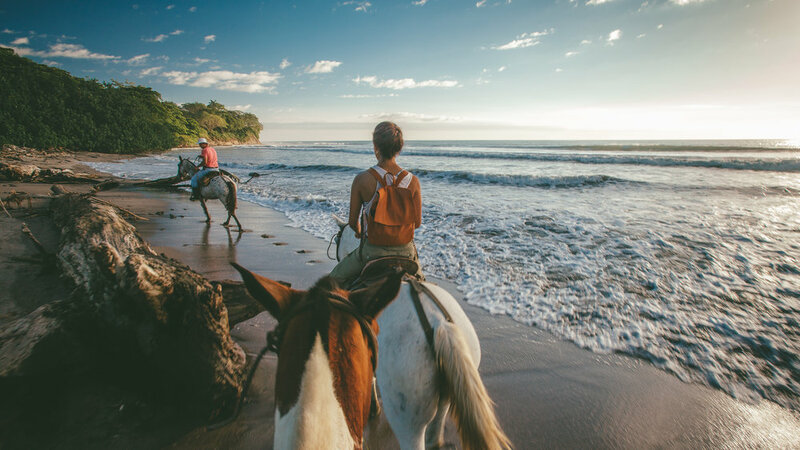 HorseBack Ridding: This is a great opportunity to go back in time and discover the sabanero lifestyle in Costa Rica, a cultural cowboy heritage that stays alive in the Nicoya peninsula. Ride on horses through deserted beaches and spectacular landscapes along with cowboys and a bilingual guide. This tour takes place in Hacienda Ario, a family owned cattle farm, which contains approximately 1925ha (or 4700 acres); the hacienda is also home of a wildlife refuge known as Caletas Ario, an important center for research and protection of sea turtles, thus becoming a model of sustainable agriculture. Happy perros de la playa!